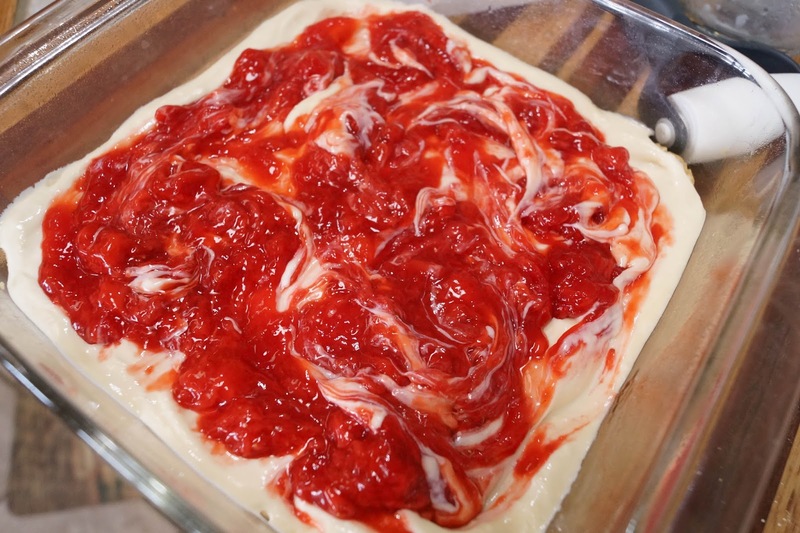 Strawberry season is in full swing here in Iowa and I've already made one Strawberry Pie for my family. 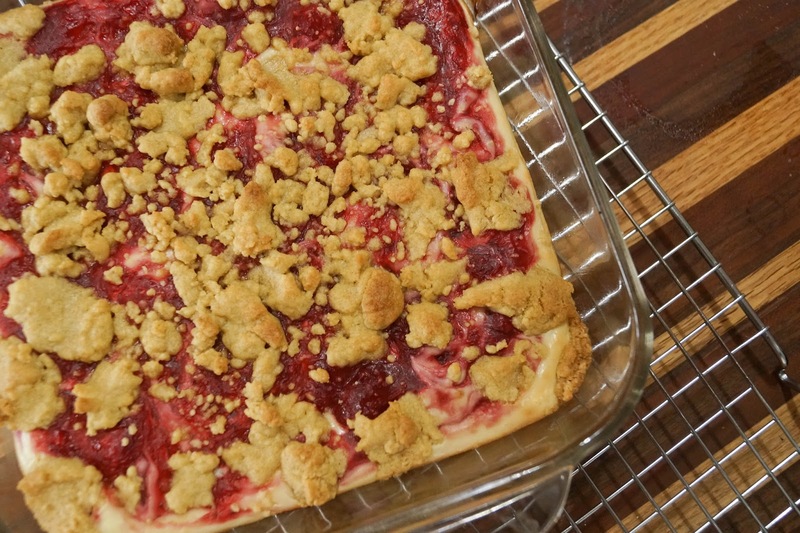 Today I changed it up a bit and made these tasty cheesecake bars because who doesn't love cheesecake?! You can use other berries if you like or even open up a can of pie filling. All I can say is that it is a good thing it makes a small dish. I can hear it calling my name from the fridge! To help myself, I'll be wrapping some up for the freezer so the family can enjoy some now and some later. 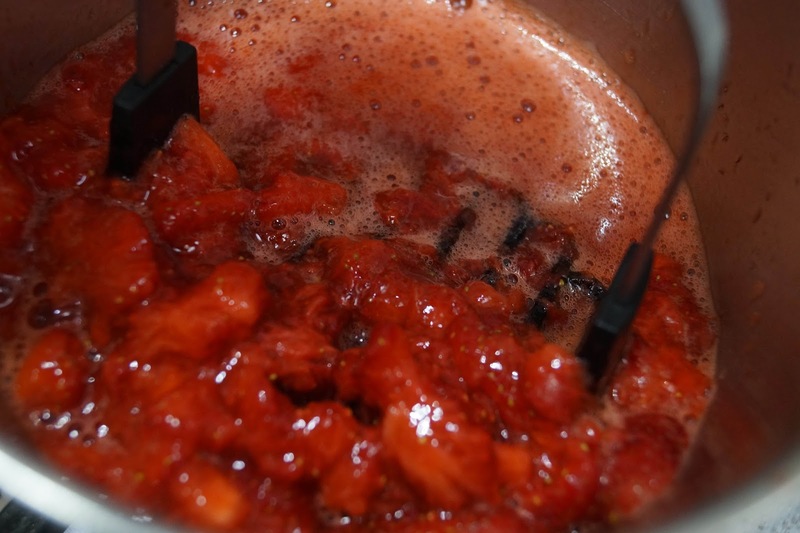 In small saucepan add strawberries and sugar. Heat until it begins to simmer, mashing the berries a little. While it is heating mix together cornstarch and water. 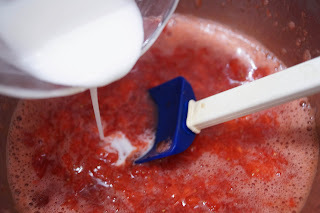 When strawberries are simmering slowly add cornstarch a little at a time until your strawberries thicken. It won't be quite as thick as pudding but will stick to your spatula. You may not need all of the cornstarch mixture. It depends on how juicy your berries are. Mine were very juicy! Pour into container and put in fridge to cool. 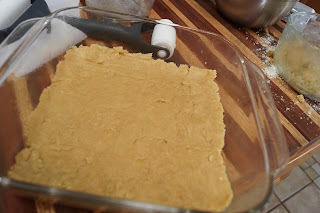 It will thicken up some when it is cooled. 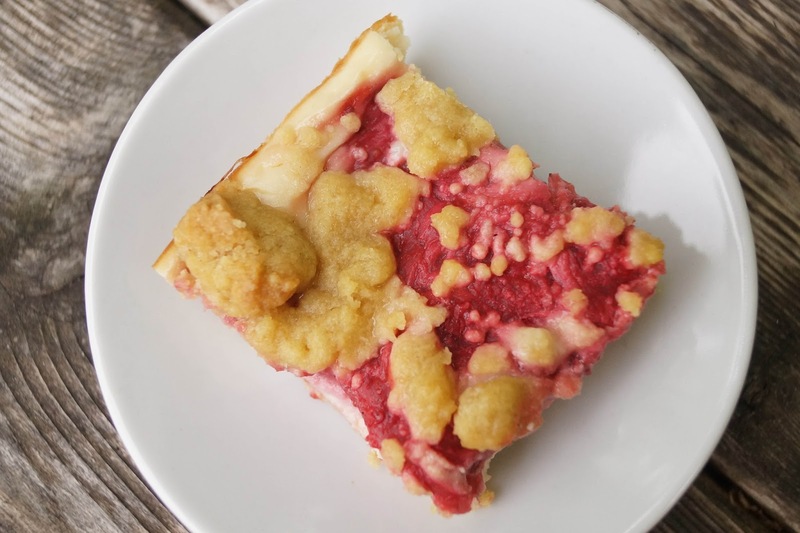 When your strawberry "pie" filling is ready to go you can start on your crust. Preheat oven to 375 degrees. 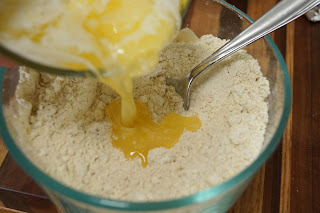 In medium bowl mix together flour and brown sugar. 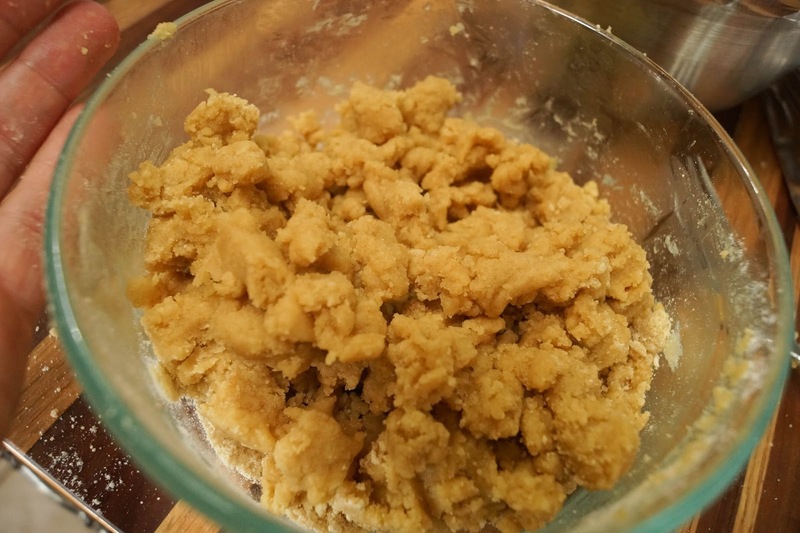 Pour in butter and combine until mixture is crumbly. I used Einkorn flour so my mixture is a little bit more chunky. Reserve approximately 3/4 cup of crust mixture for topping. Press the rest into a greased 8" x 8" baking dish. In a small bowl beat or whisk together cream cheese, sugar, flour, egg and vanilla extract. Spread evenly onto crust. 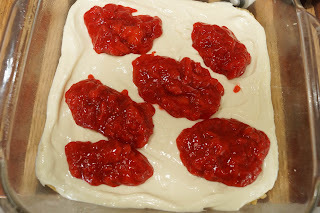 Drop spoonfuls of strawberry filling onto cheesecake layer. Sprinkled reserved crust mixture onto top. Bake for 25 minutes or until center is set. It will be semi soft to the touch but shouldn't jiggle. Cool completely (putting in fridge after it has cooled off some.) Cut and serve. Keep leftovers in the fridge. Wow, Jenny! That's a luscious looking perfect summer dessert! Yum! I love berries of all types and anything cream cheese. I would have to fight to not eat the whole pan! Yummy! Makes 12 but feeds one (in my case, lol)! Thank you for linking up with Thursday Favorite Things. These look delicious and the perfect summer time treat! 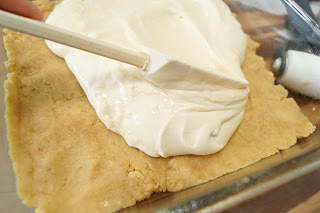 Thanks for linking up to the Country Fair Blog Party too! 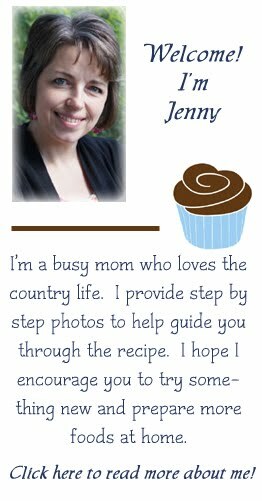 Jenny - Thank you for sharing at the Thursday Favorite Things Blog Hop. 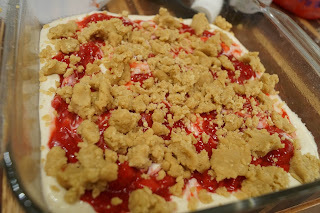 Stop by today and check out my Tuesday Treasures where you will see your Strawberry Cheesecake Bars featured! These look so yummy! Cheesecake + Strawberries = Delicious! Looks fantastic! Can't wait to give it a try!